You can currently download a free Presidents’ Day Unit Study (79-pages) from Currclick! 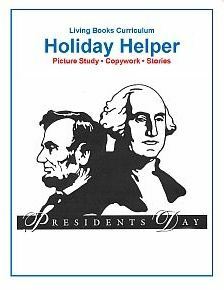 Presidents’ Day Holiday Helper is a short collections of high-quality literature, artwork and quotations which are easy to use during busy holidays; each one is designed to provide your children with uplifting and inspiring ideas and images. Read aloud and enjoy the stories. Encourage the practice of copywork and enjoy the study of great art of both Lincoln and Washington. Click here for additional Presidents’ Day resources. And here are more Currclick freebies!